Waxed paper is usually found delicatessens, farm shops and food counters but they can be used in so many different ways. For food sellers it's great for wrapping cheeses, slices of cakes & other food as well as lining displays to make them food safe. Use with twine, raffia etc and they'd even make great gift wrap. For crafters, they're great for using in resist techniques, conditioning punches and preserving in-progress craft projects. Sold in packs of 10 and sized 250mm x 380mm, they come folded in half for ease of postage. Looking for a bigger quantity? 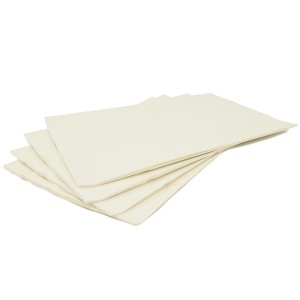 We also sell packs of 50 sheets. Just a great , good value, excellent buy.